Easy non-disruptive ITM Mode for Functional Control / NAC circuits. 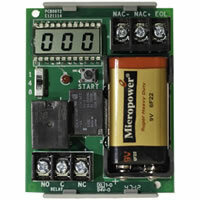 LCD screen counter to easily read the number of circuit activations. Selectable 1, 4 or 8 hour test mode before automatically returning circuit to normal operation or manual shut-off. /C versions mounted in grey enclosures. /C/R versions with red enclosure. /T versions come complete with track mounting hardware which facilitates installation in standard cabinets. UL listed as Control Unit Accessory. 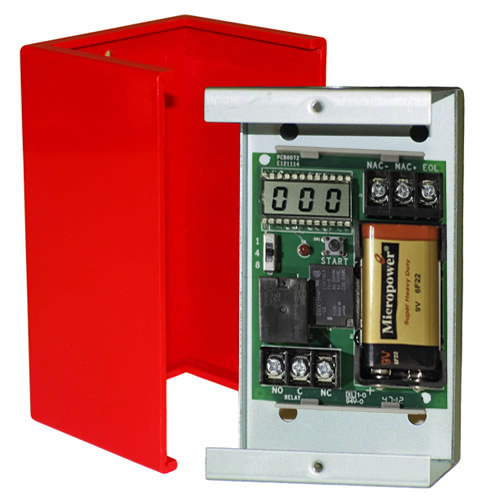 The ITM - Inspection Test and Maintenance Mode Series Relay provides a convenient, affordable and reliable code compliant solution to successfully accomplish end-to-end life safety system testing, as required by the National Fire Protection Association : NFPA 72 2013 14.2.2.1. The ITM relay provides the ability to test NAC / Function Control Circuit wiring without needlessly starting or stopping equipment during testing and maintenance. When in ITM Mode the supervised circuit will open to provide a trouble at the fire alarm control panel. All system activation requests will be counted and displayed on the LCD and can be documented without turning on the control circuit. This allows for quick, easy and non-disruptive matching of system input actions to the ITM's device(s) for correlated test and maintenance documentation. The length of the test can be set with the selectable switch between 1, 4 or 8 hours. When testing and maintenance operations are complete the ITM Mode can be switched off manually or will time out thus restoring the system to normal. 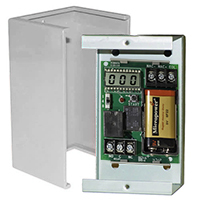 The ITM Mode is battery powered to eliminate the need for running additional power wires or added current draw. The ITM ensures a code compliant installation eliminating costly mistakes and improving your efficiency. Make this part of your installation to improve your Inspection Test and Maintenance process. The Space Age SSU-MR-ITM/C/R Inspection Test and Maintenance Mode Series Relay provides a convenient, affordable and reliable code compliant solution to successfully accomplish end-to-end life safety system testing, as required by the National Fire Protection Association : NFPA 72 2013 14.2.2.1.